It is recommended for the diabetic, rheumatoid or insensitive foot by giving the foot extra absorption of pressure and friction while the gel is not in direct contact with the skin. Product can also be used as a soft tissue supplement to fat pad atrophy. This product is also unique in that it is fully hand-washable and reusable. 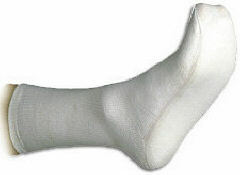 Bottom of sock has a 1/4” solid gel bottom to help reduce callus formation and to prevent pressure ulcers. A double layer sock with a 1/4" (6mm) gel insole between the layers. For any condition that requires a soft, friction absorbing foot bed. Indicated for neuropathic & rheumatoid arthritis sufferers. Reduces skeletal shock on heel strike. Servers as a soft tissue supplement for fat pad atrophy.